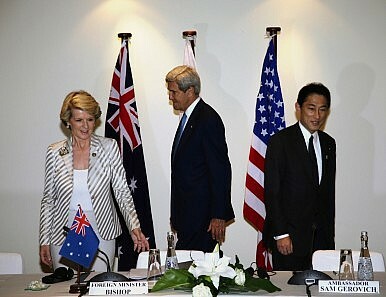 U.S.-Japan-Australia: A Trilateral With Purpose? The three countries have stepped up their rhetoric. Now they need to match that with action. Effective trilateral cooperation is never a simple endeavor. Indeed, achieving a worthwhile set of common strategic objectives is difficult enough between two states, let alone throwing a third in – even if it is a likeminded ally. Washington’s three most important allies in the Asia-Pacific are Japan, South Korea and Australia. Attempts to forge a trilateral partnership between the U.S. and its two East Asian allies has been scuttled repeatedly over the years due to sniping between Tokyo and Seoul over history and differing strategic goals. But the futility of comprehensive alignment with Japan and South Korea has opened the diplomatic capital for another key trilateral – Tokyo, Canberra and Washington – that both suffers and benefits from its geographic disparity. The U.S.-Japan-Australia Trilateral Strategic Dialogue (TSD) was first launched in 2002 at the bureaucratic level and was then elevated to the foreign minister level in 2006. After a relatively nondescript meeting in 2009, the three ministers met for the third TSD earlier this month in Bali on the sidelines of the Asia Pacific Economic Cooperation Ministerial summit. This year’s TSD Joint Statement contained the usual diplomatic reaffirmations of mutual support for objectives regarding disarming Syria’s chemical weapons as well as the next round of talks on Iran’s nuclear program. The ministers also agreed to condemn “North Korea’s continued development of its nuclear and missile programs and proliferation activities” and the U.S. and Australia even agreed to include the abduction issue as an area of concern, to satisfy Japan. The TSD statement predictably received a quick retort from Beijing, which warned the group not “to interfere in territorial disputes, otherwise it will only make the problems more complicated and harm the interests of all parties.” But while some have critiqued the TSD for taking an adversarial posture against China, the reality is that maritime security is one of the linchpins for this trilateral relationship, which extends across thousands of miles of ocean. Admittedly it would be counterproductive to direct the TSD as a tool to deter China. Still, there would be little effectiveness to a trilateral that simply dodged anything but a vanilla statement on the key maritime security issues in their own backyard while detailing comprehensive steps in regions further afield such as Iran and Syria. The Joint Statement strikes the correct balance and tone on these two disputes. For example, on the East China Sea, the three allies clearly – and rightly – side with Tokyo’s sustained appeal that China not be allowed to forcibly change the status quo. However, the statement also commits Japan (as well as China) to “avoid miscalculations or accidents” – which is an integral aspect of U.S. and Australian policy on finding a diplomatic resolution. The statement also refrains from taking a stance on the sovereignty of the islands – another long-held position of Washington and Canberra. Moreover, the statement does not explicitly endorse Japan’s administration of the islands – despite the implicit mention of the “status quo.” These nuances are important to note and no doubt have been carefully calibrated and negotiated between the three sides. The TSD continues to gain steam for a number of reasons. First, as noted earlier, the failure of a Japan-U.S.-Korea trilateral has freed up time for senior officials in Washington and Tokyo to buy into the process. A second driver has been the diplomatic triangulation between the three sides that has been furthered by Japan’s entry into Trans-Pacific Partnership talks. Finally, and perhaps most importantly for the U.S. and Japan, the TSD has been given more teeth by a combination of factors: the U.S. rebalance, the return to power of the Liberal Democratic Party in Japan, and the election of the Liberal-National coalition in Australia. Yet despite this opportunity, the TSD still faces some significant hurdles. First and foremost, the Dialogue will be ineffective if it cannot shake the perception – whether accurate or not – that it is a tool to contain Beijing. All TSD states remain focused on engaging with China and understand that encirclement would be counterproductive. While the TSD cannot ignore China’s assertive posture over its maritime disputes, it also needs to walk a tightrope so as not to isolate Beijing. This is especially important in light of Australia’s goals of greater economic engagement with China. A second obstacle will be the ability of the TSD to move beyond rhetoric and engage in comprehensive and operational cooperation. Example could include greater information and risk assessment exchanges on regional threats. The TSD can also improve operationalization on humanitarian assistance and disaster relief. Indeed, focusing the TSD on non-traditional security areas will be crucial not only in trust building but should also help soothe Chinese concerns about the intentions of the trilateral. Can growing ties help Vietnam deal with its South China Sea disputes?